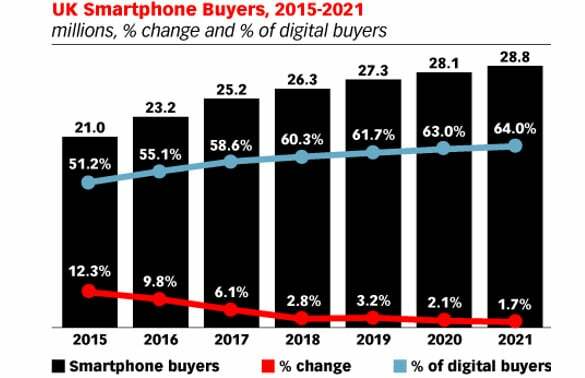 Nearly six in 10 (58.6%) UK digital buyers aged 14 and over will make retail ecommerce purchases using their smartphone this year, research released by eMarketer predicts, with retail ecommerce sales through smartphones set to reach £16.42bn (US$22.16bn) in 2017. “As a result, smartphones will be the conduit for 46.5% of the UK’s total retail mcommerce sales, which also include purchases made using tablets,” the company says. “This year’s smartphone commerce tally will be up 45.7% from a strong 2016, when sales grew by 66% — an expansion more than triple the 18% growth seen for UK retail ecommerce overall last year.